Brand new road bike, clip-in pedals & falling off! A few days ago I took my brand new Giant Defy 2 out for its first long ride. I had been waiting a couple of weeks since buying it as I had the Bath Half Marathon to complete and then needed a little time to recover with a sore knee before attempting to ride my first ever proper road bike for the first time. Super thin road bike tyres! I had taken a 5 minute cycle on it when I first got it home, and everything felt good. The main thing I was worried about was getting used to clipping in and (more importantly) out of the pedals! So to my ride… I’ve got all the kit on and the bike ready to go… less than 5 minutes into my ride and I hit my first major problem! In fact, this is the first time in all my years of cycling that a car has suddenly swerved unexpectedly towards me when cycling. It was a bad time for that to happen! On my new bike, with such a steep learning curve! I swerved, successfully avoiding clipping the car. But I have a bad acute angle going at the kerb next to me… I wobble, I try to unclip, I fail, I go down in spectacular fashion! It was all over so fast. 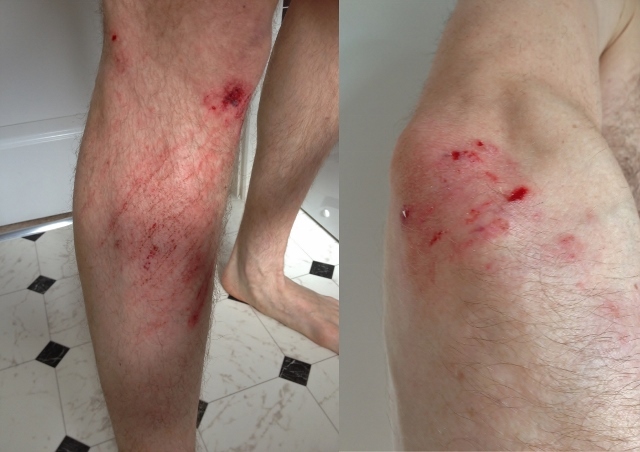 I hit the concrete and gravelled ground hard and still fully clipped in to my pedals! Luckily I scrubbed most of the speed off before the fall, but it still hurt. I landed straight onto my elbow, hip and knee, which are now heavily bruised and covered in itchy sore scabs! 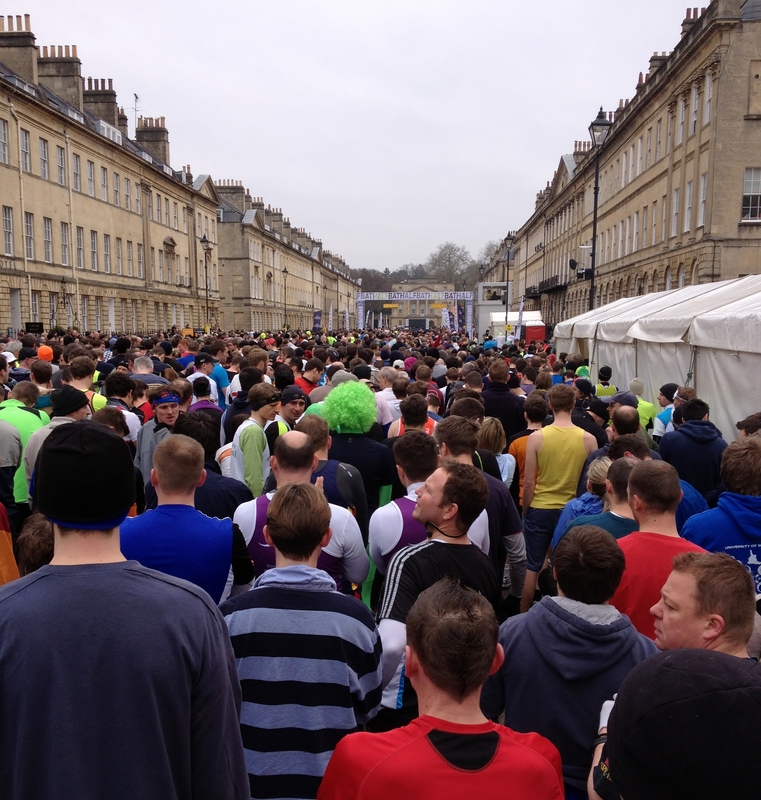 Yesterday I ran in my second ever Half Marathon, in the beautiful city of Bath. Irina, as many of our readers will know, was unfortunately unable to take part in this event due to injury. I didn’t have the best preparation mileage-wise leading up to this event, but was feeling good and determined to run it for Team PI! Irina came along and offered amazing support, giving me a real boost when I needed it. We decided to take the train into Bath as it seemed likely to be easier and less stressful than driving in with many thousands of others. Our journey in did prove to be easy and we had plenty of time to get into the runners village, familiarise ourselves with everything and get ready for the start. The day itself was very cold, and the covering clouds kept it that way for the whole day. Luckily the event organisers informed us via email before the event that if we wanted to wear an old hoodie or fleece top on the start line before the off, then they would be going round and collecting the discarded clothes and passing them on to charities. So I had a 12 (ish) year old hoodie with me for such a ‘donation’! Glad I did, but even so and even in the huge crowd of people, it was still a cold start. Not the best start to our running year & Bath Half Marathon tomorrow! Unfortunately Irina suffered a stress fracture in the hip during a late December run, and I suffered a muscular injury on the same run, which kept niggling away at me throughout January and into February. Before Christmas we both entered the Bath Half Marathon after enjoying our first ever Bristol Half Marathon in September so much. Our plan was to increase mileage through January and February in preparation to attack the Bath Half on 3rd March and beat our 2 hour time from the Bristol run last year. The forced rest has meant that Irina is nowhere near able to sensibly take part in the run tomorrow, although she is now fully healed up (properly) and back on the road again, fighting fit, fully motivated and with new lessons under the belt! I was able to get some running in through February, although due to a crazy busy schedule (including my dreaded night shifts) and re-niggling of the muscular injury, mileage was limited. I completed 9 miles a week ago, which went smoothly, although it is clear that the full 13.1 miles is going to be hard work tomorrow! Looking forward to enjoying a new experience and I’ll be blogging about it tomorrow or Monday.